Greg Lemond and Bernard Hinault on the "Tour" in "Slaying the Badger." Photo courtesy of Getty Images. UNTIL a body begins to understand the “Tour de France” or any cycling race, it just looks like a bunch of guys (usually) leisurely riding bikes. Anybody can do that, right? Of course, a body never forgets how to ride a bike. However, there is bike-riding, and there is BIKE-RIDING. The Tour de France&Co are the latter. Not only does a body have to be fitter than an iron man and have the willpower of an elephant, one has to have one's wits. All of these elements come into play in John Dower's “Slaying the Badger.” The documentary makes its world premiere today at the The 13th Annual Tribeca Film Festival. 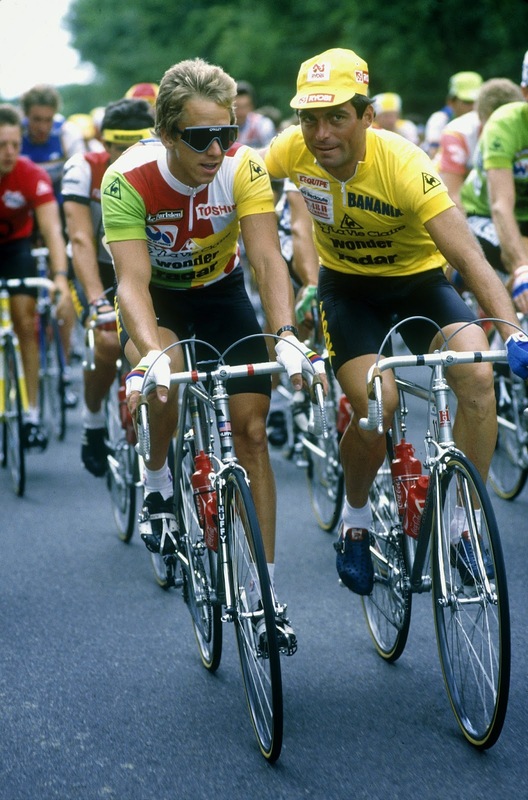 In “Slaying the Dragon,” Greg LeMond (now the only American to have legally won the Tour de France) reminisces about the 1986 race during which the reigning champion and GLeM teammate Bernard “The Badger” Hinault promises to help the Californian to victory. In “Slaying the Dragon,” evidence suggests that The Badger didn't keep his word. Not so surprising in a sport that has more twists, turns and trauma than a winding French road. Except that the two men were teammates. GLeM looked up to BH. There is trauma and drama in Mariana Rondon 's “Bad Hair” when 9-year-old Junior (Samuel Lange) makes an innocent enough request. Simply, the boy wants to straighten his beautiful mass of curls. Not forever, just for his yearbook photo. His mother (Samatha Castillo) nearly has a cow, allowing her imagination to run far, far away with her. Imagine how this effects Junior? The film makes its U.S. premiere today. Watch and learn. (See video below).